Educating the community in fire and life safety skills is a top priority. OCFR is dedicated to keeping the people of Okeechobee informed. On behalf of the Okeechobee County Board of County Commissioners as well as the men and women of Okeechobee County Fire Rescue (OCFR), welcome to our website. I hope the information you find on this site is informative and helpful. I encourage you to check back often as some of the information is subject to change. Okeechobee County Fire Rescue is a combination department that uses both career and volunteer members to serve the emergency service needs the community. The department operates out of three career stations that are strategically located throughout the county. Stations are staffed on a 24 hour, 7 days a week, 365 days a year system. The department is staffed with 42 career employees who are all trained as Firefighters with 34 of them certified as Paramedics and 8 certified as Emergency Medical Technicians (EMT). The career employees are supplemented by approximately 20 volunteers, 15 of which are certified as firefighters. Okeechobee County Fire Rescue provides Advanced Life Support (ALS) emergency medical service to all of Okeechobee County through the use of four paramedic staffed ambulances. Additionally, the department operates three paramedic engines that provide fire suppression to the unincorporated areas of the county. Various aid agreements are in place with the City Of Okeechobee and the counties of Highlands, Glades, Indian River, Martin, Osceola and St. Lucie. The field staff is under the direct supervision of the Deputy Fire Chief. The responsibility of coordination of department training, fire inspections, pre-fire planning, and department safety initiatives is vested with the Captain of Training Officer. 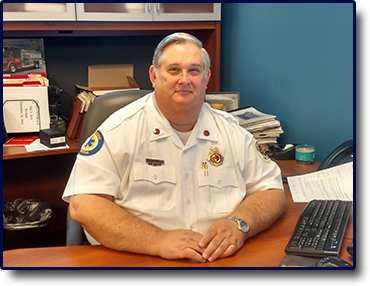 The Fire Chief has direct supervision of the Deputy Fire Chief and the Captain of Training, Fleet Services, as well as the budgetary and administrative functions or the department, with indirect supervision of the field staff. Thank you for visiting our site. If my staff or I can be of any assistance to you, please contact us at 863-763-5544 or via email at FireRescue@co.okeechobee.fl.us. 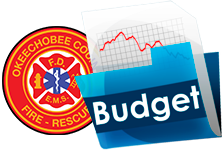 To make Okeechobee the safest county possible, we will continuously strive for excellence in all aspects of fire rescue services essential to the health and well-being of our citizens and visitors. Okeechobee County Fire Rescue’s values are driven by the duty to serve the public with compassion, pride, professionalism, and continued education. We value the faith and trust of our community, as well as the visitors to our county. We continuously strive to earn your confidence with our ability to anticipate, influence, and embrace change.